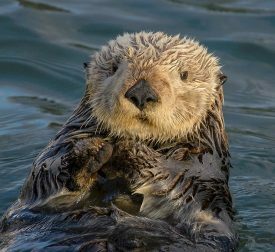 Sea Otters of Oregon: A Missing Keystone Species – April 22, 2019 at 4:00 p.m. Celebrate Earth Day at the Cannon Beach History Center & Museum with a talk about sea otters. Who wouldn’t want to talk about sea otters? Sea otters of Oregon are a missing keystone species and expert Robert Bailey will talk about how the history of why Oregon is where it is and how we can make some changes. The presentation will be on Monday, April 22 at 4:00 p.m.
Once common on the Oregon coast, sea otters were hunted nearly to extinction for their rich fur in the late 1700s and early 1800s. Their loss was a significant blow to coastal native people and to the marine environment. Although sea otters have returned elsewhere, they remain missing in Oregon. What will it take to help them return? This talk will explore the history of sea otters in Oregon, their ecological and cultural importance, and the prospects for their return and recovery. It will touch on the mission of the Elakha Alliance, an Oregon non-profit organization devoted to sea otter conservation. The Cannon Beach History Center & Museum hosts a series of off-season lectures on various topics from astrophysics to Sir Francis Drake. The museum is located in mid-town Cannon Beach and is a private non-profit that doesn’t receive city, federal or state funding. Admission to the museum is donation based because they believe history should be accessible to tall, no matter financial status. The Cannon Beach History Center & Museum is open Wednesday through Monday, from 11:00 a.m. until 4:00 p.m. Seating and parking for this event is limited, so arrive early. Take advantage of this opportunity to visit the museum and check out their latest exhibits. The museum currently has an art exhibit featuring local artist Stirling Gorsuch and an historic exhibit on the shipwrecks on the Oregon coast. There will be complimentary coffee, tea, and sweet treats at this event. This is part of the 12 Days of Earth event series. Martin North (Surfsand Resort, Public Coast Brewing, Stephanie Inn, Stephanie Inn Dining Room, Wayfarer Restaurant & Lounge, Haystack Gardens) has sponsored this event. Steve and Jan Martin established Martin North in 1979. The Martin family brought hospitality in Cannon Beach to a whole new level. Each of their properties has grown and changed with the families who live and visit here.